For some weeks prior to the event itself, on Feb 6th this year, maybe since Gregorian New Year, there have been various bangs from fireworks. It is a tradition here to set chains of firecrackers off at each stage of a building success, typically at completing at the structure of a floor, I suspect. Firecrackers are 5cm of banger much the same size as a blank cartridge and a chain comes as a roll maybe 35cm in diameter, so perhaps 200 bangs in a chain (interesting maths to think about, there, while the 200 is a guess from listening). The idea is to ward off evil spirits, probably including such as us foreign devils. The frequency of these banging episodes, a little softer than blank because of the relative lack of confinement, increased steadily up until the New Year break and then escalated to include the odd firework. On the Monday and Tuesday I was aware of sales of buckets of fireworks in the street, including advertising by setting the things off in unlikely places (to my eyes) such as the middle of the street. Literally; traffic running either side. 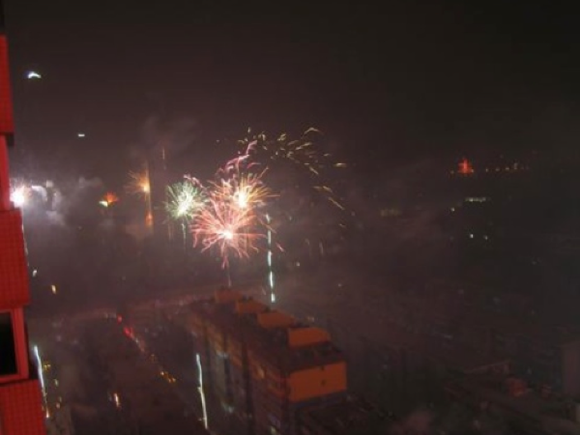 The evening of the New Year, which happened also to be the end of Shrove Tuesday, I was dining high in a tower block in Western Xi’an. Thanks yet again to Tina and her Uncle Jack. taken largely from Wikipedia, but mostly my word choice. The Chinese use the Lunar calendar for their festivals so the date of CNY is not fixed. The date corresponds to the new moon (black moon) in either late January or February; hence the second new moon after the winter solstice. Traditionally celebrations last for eight or fifteen days, ending on the date of the full moon. Between a sixth and a quarter of the people in the world celebrate Chinese New Year, depending whose information you believe. Customs vary but everywhere the main idea is that it is a time to remember the family – and to wish everyone peace and prosperity in the coming year. The Gregorian calendar was adopted by the general public in 1912 (after the Boxer rebellion, I guess) although it arrived with Jesuits in 1582, when Europeans began using it themselves. and the second cycle is the better-known one of the year names and called the Terrestrial Branch. Each of the two components is used sequentially. Thus, the 1st year of the 60-year cycle becomes jia-zi, the 2nd year is yi-chou, the 3rd year is bing-yin, etc. When we reach the end of a component, we start from the beginning: The 10th year is gui-you, the 11th year is jia-xu (restarting the Celestial Stem), the 12th year is yi-hai, and the 13th year is bing-zi (restarting the Terrestrial Branch). 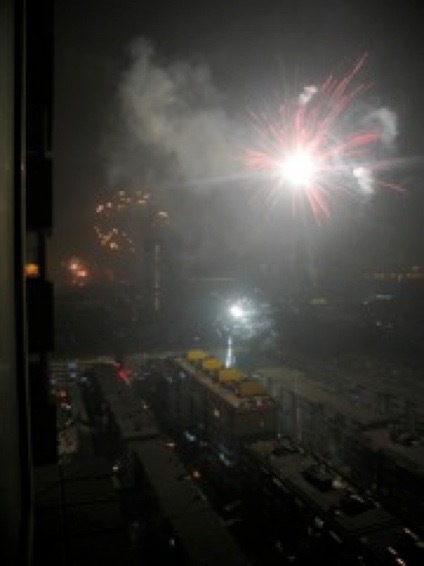 Finally, the 60th year becomes gui-hai. It is customary to number the 60-year cycles since 2637 B.C.E., in the time of Emperor Huangdi, when the calendar was supposedly invented. In that year the first 60-year cycle started. Thus we should be up to 2637+2008=4645, except this is 4706, so it would appear counting began, or has been backdated to, 4706-2008=2698BC. I have found no explanation of this. Leap years in this calendar, e.g 2009/10, have 13 months. A leap year has 13 new moons, counting between the 11th month in one year (i.e. the month containing the Winter Solstice) and the 11th month in the following year; in a leap year, a ‘leap month’ must be inserted. In leap years, at least one month does not contain a Principal Term and the first such month is the leap month. It is given the same number as the previous month, with the additional note that it is the leap month (runyue). I read that there are 7 leap months in 19 years – you are welcome to disagree, but that apparent correction brings the lunar calendar in line with the solar one. A typical lunar year is 12x29.53 days, making 353-5 days. A sidereal year is 365.24 days. Apparently, (meaning I found the info in a tertiary source) in the early 1990s Chinese astronomers discovered that there was an error in their calendar for 2033. The traditional calendar claimed that the leap month would follow the 7th month, while ‘in fact’ it comes after the 11th month3. It is very unusual, even though the system is/was systematic, that the 11th month itself has a leap month. Indeed, records show it hasn't happened since the calendar reform in 1645 (before 1645, all months had the same probability of having a leap month). Many Chinese astronomers still claim that there will (must) never be a leap month after the 12th and 1st month (because? not discovered). In addition, there will (should be?) be a leap month after the 1st month in 2262 (and it should have happened in 1651, but they got the calculations wrong!) and there will allegedly be a leap month after the 12th month in 3358. Since the Chinese calendar is an astronomical calendar, predictions require delicate (sic) astronomical calculations, so the computations I found for 3358 should probably be taken with a grain of salt. Or a mine-ful. The incidence of fireworks rose steadily through the eating phases of the evening, hitting an early peak around 2030 when families are deep into making small meat dumplings (Cornish pasties writ small, maybe 60mm at their longest). The external noise sounded like news-tape of Beirut, or Kuwait City, or any really large forces exercise, only without pause and scattered over the huge area that is this city. The rockets blowing their blooms could be seen as far away as I could see, which was probably further than across Glasgow. If there is a next time, I will get onto a roof and see in more directions. As it was, I was facing north from the west side of the city, so maybe as much as a quarter of the city was visible and excluding the centre. In the most frenetic moments, either side of midnight, there was a haze (seen in at least one of the three pics) created by the sheer number of fireworks. Since the floor I was on was above the 20th, this represents an affluence - or a terror of devils – we in the West have trouble comprehending. The three pictures were taken in the last ten minutes before midnight. The Chinese New Year is celebrated in a 60 year cycle starting from the second new moon after the winter solstice and falls between January 21 and February 19 on the Gregorian calendar. The year 2007 translates mainly to the Chinese year 4705. Similarly 2008 translates to 4706. 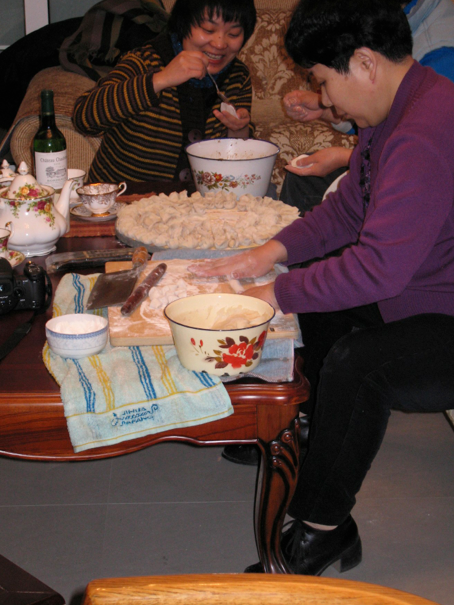 This last pic is of the family fun of making dumplings. Not that anyone had any capacity left to eat, but that is not the point at all. 1 2012, reading this with C to hand, it was along time before she identified the traditional form of the character. She says that many will basically utter the epithet “Idiot” before they read the following paragraph and say “Oops” to themselves. Me too, on this occasion. I’d called C to read before I read the next bit. Idiot, indeed. 2 This could be better explained. I took what there is on the wiki site and tried to make it read better (better still). I don’t seem to have succeeded. Help appreciated. 3 We may see and hear new argument in 2033, if we live that long; I’ll be 80 (eek).